I hope all of you had a fabulous holiday weekend! 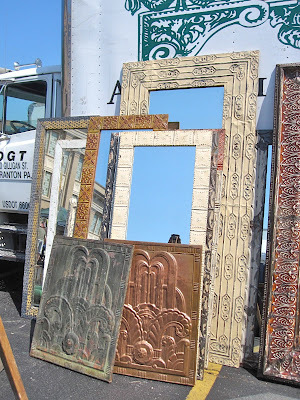 I did, in large part, because of my wonderful trip to the Randolph Street Market, Chicago's biggest flea market of antiques and vintage furniture, home decor, jewelry, and other fun trinkets. I wanted to share some more photos with you because it was such a treat walking around looking at all the treasures for sale and imagining what I could do with them in my own home. It was not as fun narrowing down my selections seeing as there were so many items I wanted. Here's a peak at what the market offered. This antique workbench reminded me of the Pottery Barn replica I saw when I toured their new Chicago store. The Pottery Barn Markham console bar. 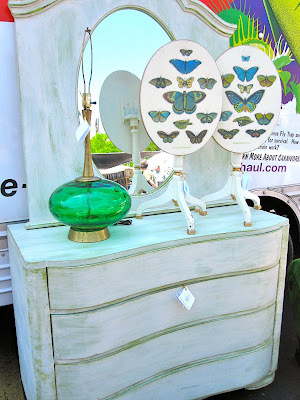 These tables are amazing and I noticed several vendors were selling similar pieces. I'd love this as a coffee table. Coincidentally, Pottery Barn also sells something very similar: the Wheel Indoor/Outdoor coffee table. Wanted one of these floor mirrors framed with vintage and antique ceiling tin tiles. Unlike my Ikea tulip table, this mod beauty is the real deal. How fantastic is that light fixture? 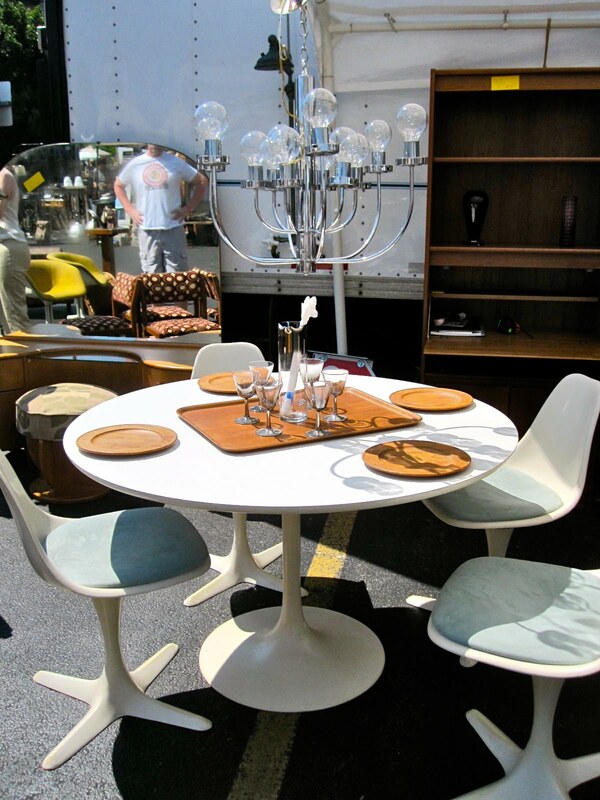 These babes - similar to the Eames Molded Plywood chair - were selling for $350 a pop. Wanted this vintage fan but I wasn't sure if it worked. Oh how I love antique globes. And yet I still do not own one. These were all a bit overpriced. I think the cheapest one was $80. Beautiful vintage French pieces. That gorgeous chest of drawers is the same color as my new birdcage, and I am now declaring it my second favorite color, after yellow. What color is that exactly? Teal? Sea green? Antlers would be amaaaaaazing on a mantel, a la this room from the cover of House Beautiful. The perfect writing desk. I imagine Jane sat at something similar as she penned P&P. Yea. We're on a first name basis. Jealous? More goodies. Loved the croquet mallets. Those blue shelves were hella cool and sold after the first hour. I wanted that 2 but didn't get it. 2 is my favorite number. And now you've all learned something new today about yours truly. Cool vintage flashlights. Reminded me of Molly Saves the Day. Tell me someone out there knows what I'm talking about. Antlers, antlers EVERYWHERE. Can antlers be trendy? Because I swear they are. This market had the coolest farmhouse tables - all for under $900. Solid craftmanship, great size, all together perfect if you're in the market for one. I just have no idea how you'd get it home. *UPDATE: The producer of the Randolph Street Market just informed me that onsite delivery service is available AND/OR many of the vendors will provide delivery to anywhere. Another one of those wheel coffee tables! I picture this in a sunroom/mudroom/greenhouse with lots of potted plants in it. If only had I had somewhere to put this perfect green, genie-in-a-bottle-shaped lamp... If only. Hi, my name's Alaina. And I'm a lamp-aholic. Anthro was selling something similar for some outrageous price. These beauties were $12! No idea what these little bottles were for but they were beautiful (albeit a little dirty). That mirror was bigger than my apartment. Great garden furniture. My besties modeling the vintage jewelry. One of these vintage beauties came home with moi! The coral and gold one - second row from the top, second column from the right. Right above the empty slot. See it? Yea. It's perty. My gal pal took home this darling little chest of drawers for her bedroom. Loved this gold tray for holding jewelry and perfumes. Fortunately, I've already got that covered at my house. These chairs are GAWgeous! You may have noticed I said that in my Jersey accent. THIS farmhouse table was a measly $250! WITH the two benches. So many great collections of vintage barware. Perfect... if you have a bar. Which I believe should be a staple in a home. Or office. Very Mad Men. *Note: I will continue with my dining room chair makeover on Thursday. Looks like you had a great time at the fair! I feel inspired by your photos but would have had a hard time searching through the near-infinite options out there. Thanks for paring it down to some real gems! So cool to see all that you got and liked at the market! I ended up going with a friend and had a great time on Sunday. In my hunt I found three stacking bowls that are cream with gold metalic polka dots a la the Kate Spade glass/silver dotted vase from Michelle Adam's Lonny photo shoot. I love them and can't wait to go the market next month! By the way, LOVE the chest your friend got!! Ohhh these posts make me so jealous! I am DYING to get back out there and shop the fleas and vintage markets...One more month until my shopping ban is lifted! I lived an hour from Chicago all my life and never knew of this place - I really missed a gem!!! Oh wow, that looks like an incredible market!!! Love your ring too! All these lovely pieces of furniture just made my 2.5 hour lecture sooooo much more bearable. You're killing me! Could there be any more fabulousness in Chicago? I went to a small flea market on Melrose in West Hollywood this weekend and it was such fun too. Nothing beats a good vintage find. only 3 words, AMAZING treasure cove!! I am dying right now! I cannot wait to go! Love that vintage french chest of drawers. Gorgeous! Do you remember what the price tag said? Just curious. Great pictures! I want so much of it! Also, I just opened the prints I ordered from your Etsy shop and I adore them! I liked your little note almost as much as the prints themselves! There's some gorgeous stuff there! i love those mirrors framed with the tin tiles! I also loved that french chest of drawers. That color is gorgeous. I'm going to have to find something to paint that color, soo subtle. Great pictures overall though! I wish I had a market like that near me. That looks amazing!! I think all interiors should have something "repurposed", whether it's a piece of furniture, lighting or accessories. These one of a kind items really personalize a space. I am a big fan of vintage jewlery too!! Amazing! Is this a monthly market? Do you have any information on when the next one is? Thanks!! !